In the previous post we went through the long GUI in EMR which allows you to provide the settings of the Hadoop cluster. We didn’t actually start any machines, we’ll do that here. In this post we’ll also log into the master node of the cluster and try a couple of Hive statements. As noted before in this series Hadoop is almost exclusively deployed on Linux so it’s no surprise AWS EMR also prepared a Linux master node for us. It has all the resources available to start working with our Hadoop cluster: Hadoop itself, Hive, Pig and Hue, of which we’ll be looking at Hive. 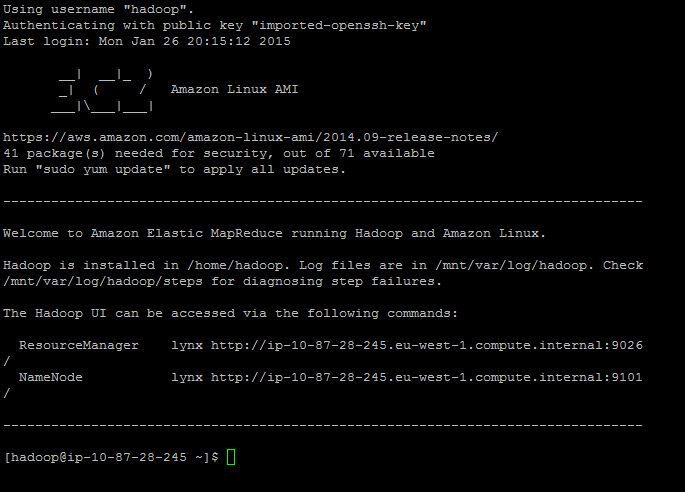 That’s all it took to start up a Hadoop cluster in Amazon. Of course the hard work of getting to know these tools is just starting but the setup phase went quite quickly. You’ll probably understand the value of such a service as you’ll be able to concentrate on the “real” problems and jump over the preparation phase. E.g. this page lists all the steps required to install Hive on Hadoop. That’s all been taken care of by EMR, you can start typing Hive and/or Pig as soon as the cluster is available. We’ll explore a couple of Hive statements in this series but we’ll only scratch the surface of what’s available as we’ll jump over to .NET soon. This page gives you a lot of details on the Hive syntax. It looks very much like normal SQL so it should be very easy to follow for most of you. Keep in mind that Hive is running on Java in the background. Hive aggregation statements are often translated into Java MapReduce statements behind the scenes. This is also manifested by the compulsory ‘;’ at the end of each statement. If you enter a statement without the delimiter the Hive CLI will not carry it out but simply jump to the next line waiting for the semi-colon when you press Enter. We’ll see some examples later. …which gives sample_07 and sample_08 which have been installed by Amazon for testing. They are both located in the default database on HDFS. These show the same details but “formatted” is much more easier to read. You’ll see at least one interesting bit: Table Type is MANAGED_TABLE. This means that the table resides on HDFS – i.e. the Hadoop Distributed File System – directly and if you drop the table then all the table data will be deleted as well with all indexes etc. On the contrary it’s possible to have EXTERNAL tables with Hadoop where the data resides somewhere else and Hadoop only has a reference to it. If you run a “drop database” command against an external database then the data won’t be deleted. We’ll see an example of an external database in the next post when we start working with data stored in Amazon S3. This is enough for now. You can close the SSH session. We’ll look at more Hive commands in the next post.